Eden* (AKA Eden) is a dramatic visual novel set in a time where the Earth is nearly at an end, so most of the population have left the planet and gone into deep space. Only a few people are still left on Earth and this is where we see the main character of this story, a young adult named Ryou Haruna. 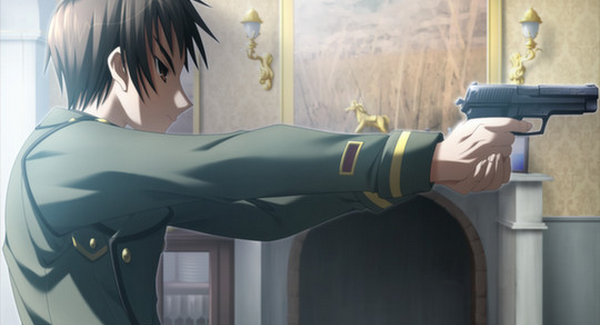 Ryou is a very hardened soldier after having been to many wars and he is also an elite sniper with some serious skills. Ryou's latest mission has him stationed to a small island that has a very important science institute on it to where he'll be a bodyguard of an important person named Sion. Sion isn't your typical person as she is a type of human called a Felix (not the cat) that is also the next step up on the evolutionary ladder, so she possesses a lot of brains and has eternal youth when it comes to her looks. 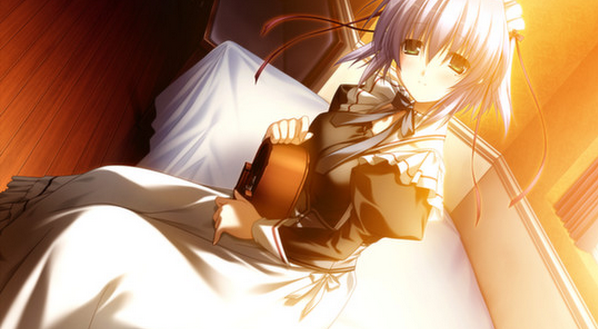 This island institute also has a lot of mysterious things going on and they will all unfold during Ryou's stay there. There's also a lot more going into this visual novel other than just a mystery and I'll get to that deeper into this review. It's the end of the world as we know it, but will this visual novel be fine? (Click "Read More" to read the full review). The story in this visual novel does start off a little slow but in a good way to where it builds up suspense and makes you wonder what is going on. The build-ups do end in a very satisfying way and also helps to make the story very interesting. This story mainly focuses on progressing through very long scenes of dialogue despite having a militaristic sci-fi setting but the conversations that are had in this story are mostly very interesting and will keep you hooked. There are some action scenes in this visual novel and for a visual novel, I found them to be very interesting as some of them got very exciting, intense, and even added to the drama. Don't expect any of the action to be animated as it is a visual novel after-all but that doesn't mean that you won't be entertained or excited by the still images. 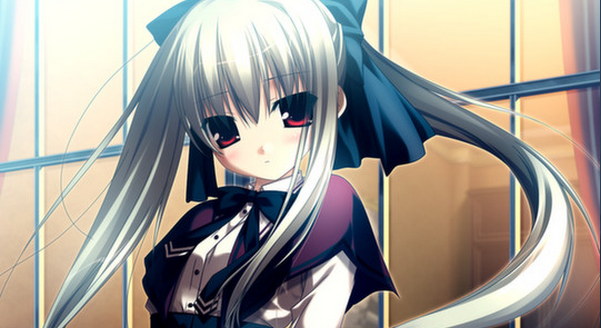 Drama in this visual novel is good as it was entertaining and it does grip you into the story. There were some scenes where the drama was especially strong and it will mess with your emotions where ever it be sad emotions or angry emotions. While I did like the drama, I did find it to be a little cliché and unoriginal and that's what stopped it from being a truly amazing five star drama that could've been in a top ten greatest visual novels of all time list. The characters didn't have much to them but that doesn't stop them from being interesting as they had nice personalities and interesting back stories. While I did like the characters, I wasn't in love with them at first as I didn't like their attitudes but the more the characters grew, the more you'll like them and that looked to be like that the characters were made like that on purpose and all I have to say is... Well played. The slow burn character development worked well as it made for stronger character development. I didn't enjoy every scene as there were some scenes that just dragged on for way too long to where it got a bit frustrating to sit threw. One intense scene drew out for so long that it made the pacing of the events that took place during that scene to feel unrealistically paced and ruined any urgency from that scene. The other scenes that drew out for too long were just scenes with filler content and those scenes got boring and only felt like they were in there to just pad out the story and make the story longer. Those scenes with filler in them did have some vital information and felt like that they slipped in the vital information just to make our time sitting though filler to be justified and felt like a slap to the face. Speaking of progress, the length of this visual novel is not one that you'll get through in one sitting as it takes around seven to eight hours to finish and it could've been done in five hours if they cut the filler out. Artwork in this visual novel is very good as it has some very good looking character designs and some very strong coloring that gives this game a mature look. The detailing on the backgrounds and scenery is really good and make for some beautiful sites. The detailing on the characters face and hair are pretty standard but the detailing on their clothing looks very nice. This visual novel does have some animation for the facial movement and while the animation is very minimal, it does have a certain charm to it to where it works very well with the visual novel. The voice acting in this visual novel is very good as all of the voices suited the characters well and the actors pulled off some very decent acting. The music in this visual novel sounded very nice and went well with the story although I also wouldn't say that it is the most memorable soundtrack you'll ever hear but it did have a few strong tracks that will stick out and be engraved into your memory. There was one scene in this game where the music was very overpowering to where I could barely hear the voice acting and it got a little frustrating to sit through. Overall, this is a very decent visual novel and was a blast to read despite all the flaws. I'm going to give this visual novel a rating of "yes", however I wouldn't be so quick to dive into this one if you are looking to get into visual novels as this one is more aimed to people that are already into them. Decent visual novel.